Layer Match has been around for a while as an Express Tool, but now is part of the Layer 2 Toolbar. 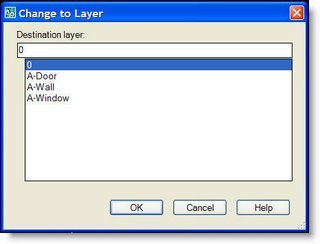 Issue the command and select an object (or objects) to be changed and then select an object that is on the layer you want them to be moved to. Enter “N” after selecting the object to open the Change to Layer dialog box, then you can select a layer by name. If you enter -laymch at the command prompt and the options and inputs are displayed at the command prompt.